The Russian Orthodox Youth Committeeʼs publishing arm always had a missionary goal. 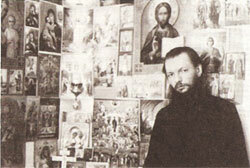 ROYC was started by Protodeacon Nikita Chakirov in 1968. The Reverend Father Nikita Chakirov was the life-long dedicated assistant to Metropolitan Philaret Vosnensky, the third hierarch of the Russian Orthodox Church Abroad, who blessed its missionary work. 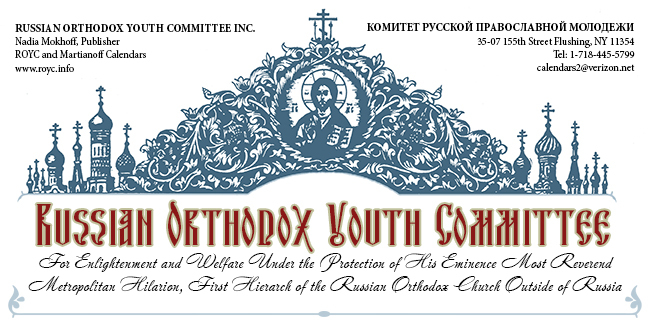 At its inception the Committee had several goals: to serve the people of Russia under communist atheistic rule, to give financial help to our monasteries around the world, to enlighten Russians living abroad in the free but not religiously Orthodox world, and to educate the young generation in the Russian Orthodox tradition. In order to reach these goals the Russian Orthodox Youth Committee published spiritual and historical books, printed Orthodox calendars, sponsored pilgrimages and youth meetings. This was all achieved by the extraordinary organizational work of Reverend Nikita Chakirov until his death in 1987. Today the Committee comprises the Youth Program administered by the Right Reverend Andrey Sommer, and the ROYC publishing arm headed by N.Е. Mokhoff. When it was launched, the monthly Russian Orthodox Youth Committee Calendar, designed and edited by Reverend N. Chakirov, was the only illustrated calendar in Russian émigré circles dedicated to the venerated Orthodox traditions and Russian pre- revolutionary history. It became bilingual in 1996 in order to better serve the community. The daily Martianoff Calendar is the oldest surviving émigré calendar. It was read by our grandparents and parents, and now by us and our children. More important is the direction the calendar has taken in the last 20 years. Besides indicating daily church readings of the Gospel and the Epistle, and listing the daily commemorated saints, the Martianoff Calendar contains daily short essays on Russian culture, philosophy and history intertwined with Russian Orthodox history and philosophy, folk sayings and short literary gems. The essays are aimed at promulgating Orthodox thought and mindset through the words of Russian authors and thinkers. The current publisher, designer and editor of the ROYC calendars is N.Е. Mokhoff, who has worked in the ROYC since 1968. ROYC is under the aegis of the New York-based Russian Orthodox Church Abroad, which is now affiliated with the Moscow-based Russian Orthodox Church.